If you and your family love vegetable quiche recipes, this one will be a hit for sure. 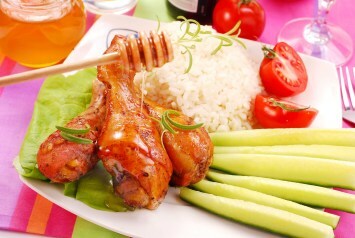 It is filled with a variety of healthy vegetables of your choice and rich with cheese and cream. Don’t worry too much about calories and fat though. A filling serving of this dish is not very large. If you are really concerned and want to cut the cream see below for our recommendation. Spray a 12" quiche pan or a deep dish pie pan with non-stick spray. Spread cheese on the bottom of the pan. Add chopped vegetables. Whisk eggs, milk, cream and seasonings together. Pour over cheese and vegetables. Bake until just set in the middle, about 45 minutes. Note: Feel free to divide the ingredients in half for a smaller, regular pie plate size recipe. Make it low fat – replace the cream with lower fat milk. Remember though that the cream give the quiche a lovely rich flavor and texture that will be missing a bit with the low fat milk. Add 1/2 cup chopped ham for a non-vegetarian quiche. Real men will eat it! Add a pie crust to make a regular quiche. Bake as directed for the quiche recipe found here. 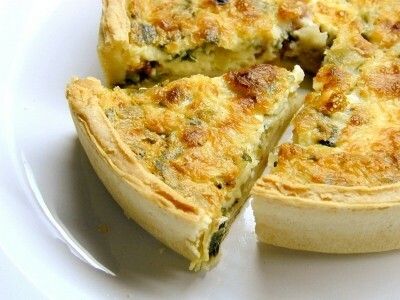 Note that the image shows the quiche with a crust. Because there is no crust called for in this recipe, it is a perfect low carb quiche recipe. I have made it many times when I was on a low carb diet and it is delicious. You don’t have to be a fan of low carb recipes though to love this quiche though. It’s quite wonderful. 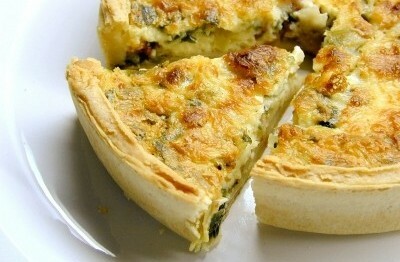 If you would like a “proper” quiche with a crust, look here for our pie crust recipe and bake this filling in a crust. Make a double crust recipe for the full quiche recipe. Look here for more egg and quiche recipes for breakfast or any time of the day.